i bought a yard and a half because initially i was going to use it for my daughter, mostly because i thought the chevron might be a bit cray cray for my own use. however, i got it in my head that i could probably squeeze out a shift dress for myself, so i ordered her a different fabric to make up for it (yet to be sewn). 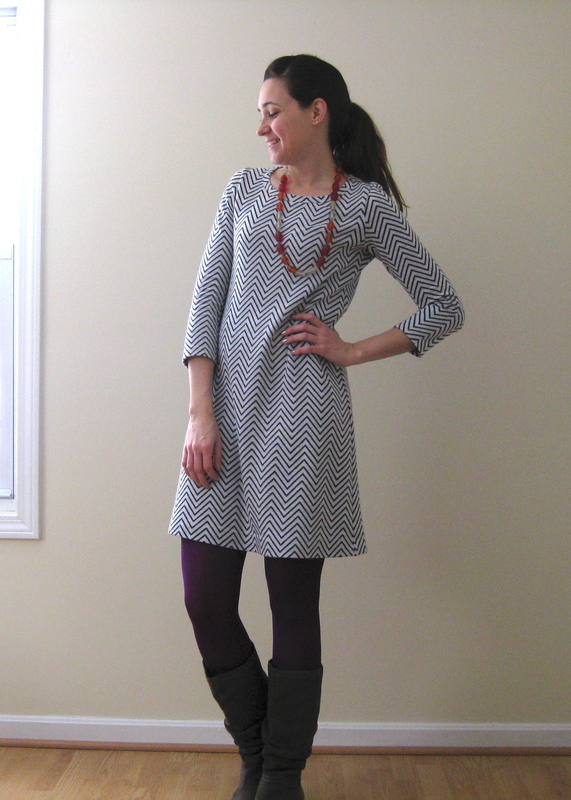 i put out a plea on instagram for recommended shift dress patterns and while there were some great suggestions (HERE, HERE, HERE, and soon to be released T & TB coco) i decided i wanted to go with a pattern i had experience with. 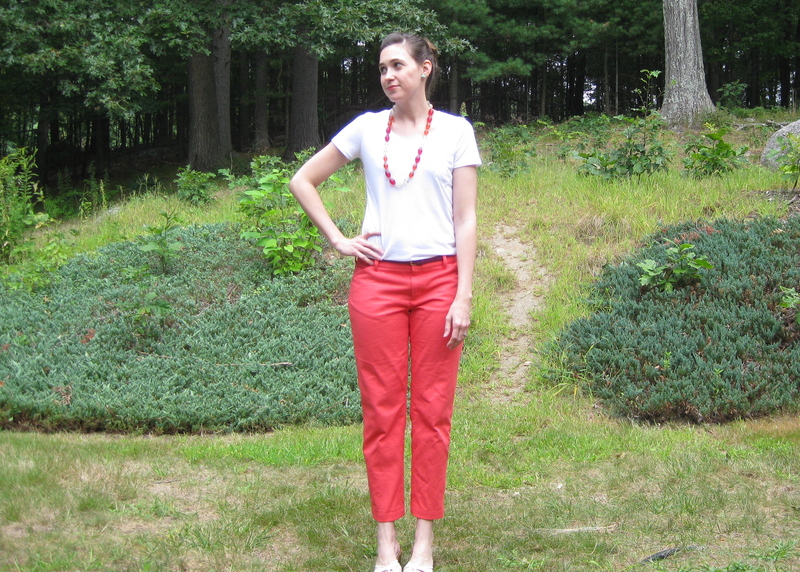 or rather, patterns—the renfrew and mccalls 6559.
now i hadn’t mashed these two before, but it was pretty easy to do. i simply marked the waistline on my renfrew and lined that up with the waistline on the mccalls. i wanted less shaping than those patterns have, so i cut it relatively straight from bust to hip. 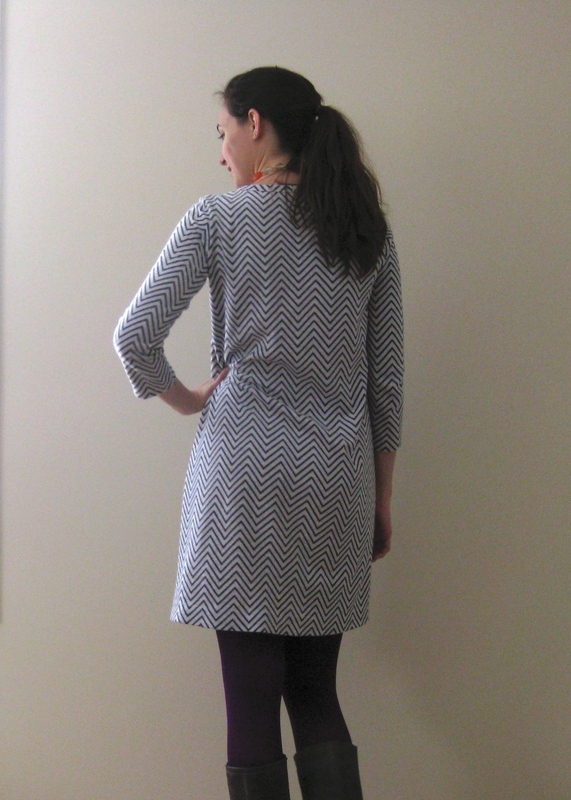 the mccalls dress is more fitted in the hips, so i added an inch to the side seams, giving me an extra 4″ all around. i wanted a higher neckline, and i planned to do a binding instead of an added on band, so i cut the neckline accordingly. 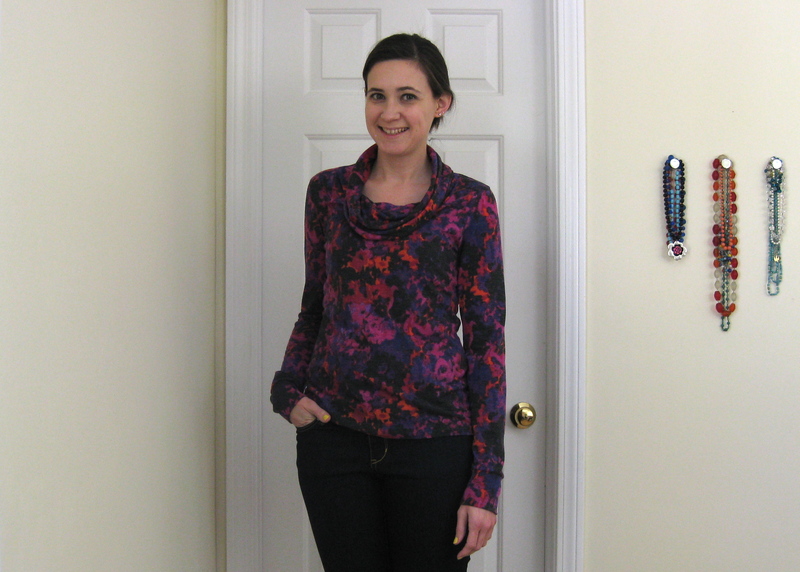 i tried out a few methods of binding on scraps and finally came up with the following: i measured around the neckline and cut a 2″ strip to that exact length. 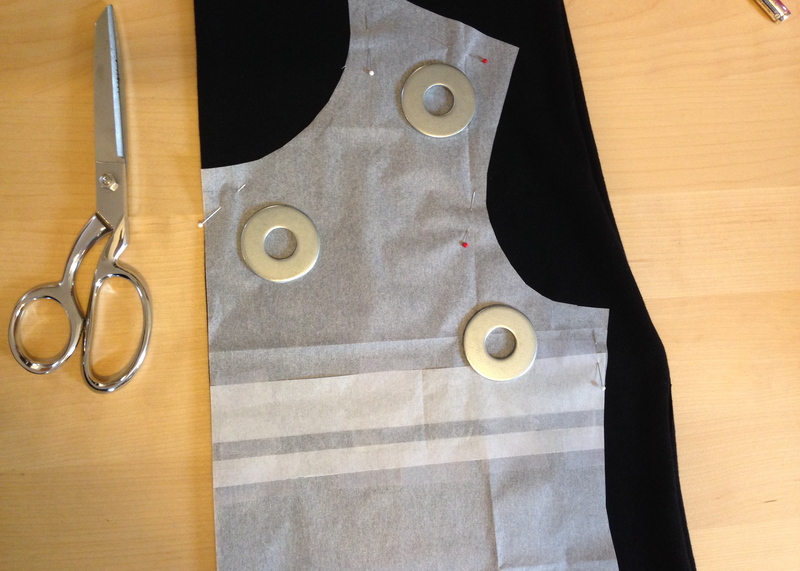 then i sewed it into a circle with a 1/4″ SA (making the strip 1/2″ shorter than the neckline). 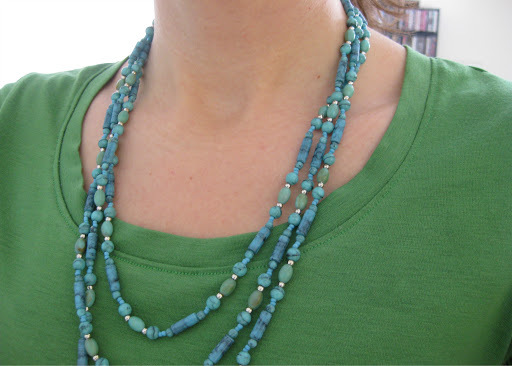 i pinned it RST around the neck, stretching it slightly around the curves. 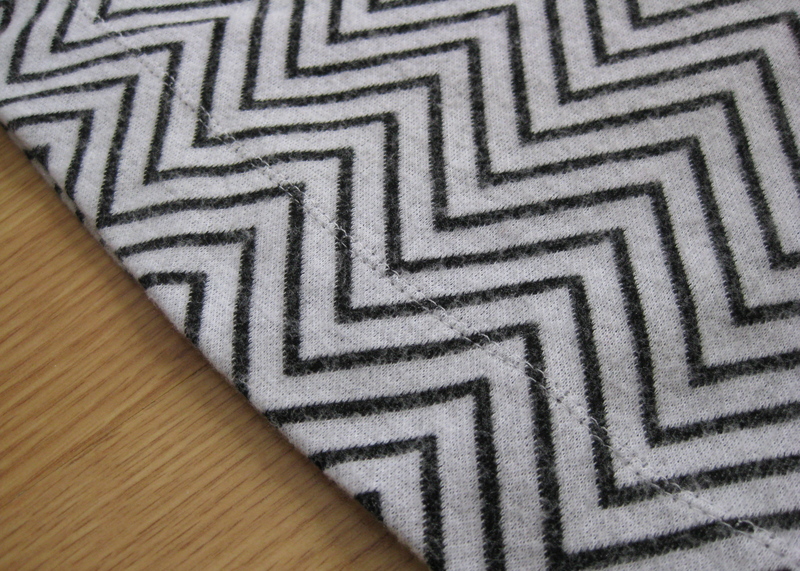 then employing my walking foot, i sewed it on with a zig zag stitch to retain stretch. i aimed to have the leftmost swing of the zig zag at 5/8″, because that is how wide i wanted my binding. i trimmed down a little of the binding to reduce bulk, then i pressed it up, careful not to pull too hard, and pinned it to the inside. then i used my twin needle to topstitch the binding in place. on the inside i went back and trimmed off the excess binding. sorry i don’t have any step by step pics, but it’s basically the same as this method, only wider. since my fabric was so beefy and doesn’t have a ton of stretch, this was ideal. a regular renfrew-esque neck band just wouldn’t have worked. i have to say, i am pleased as punch with the binding—it looks so legit! then i finished the sleeves and hem with a simple turn and twin needle. this fabric was so easy to work with it gave me no problems whatsoever. 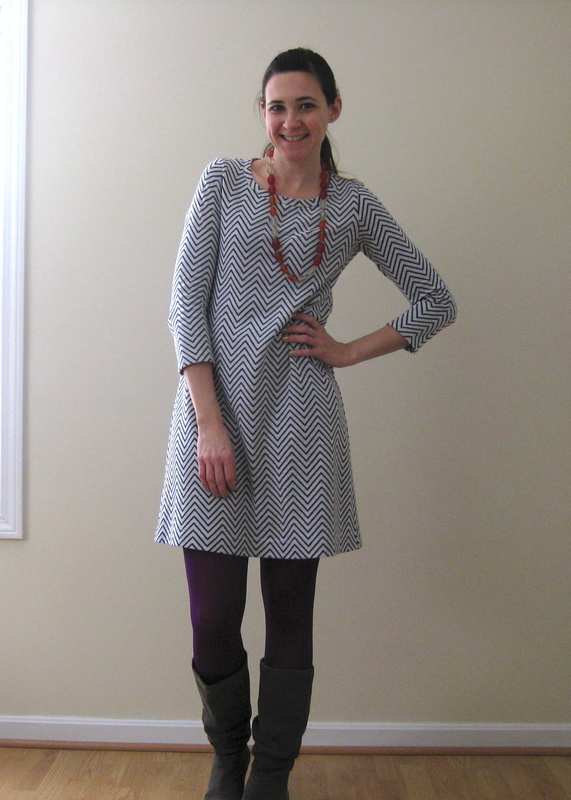 the shift dress is really a new shape for me, and i’ve quickly fallen in love with it. 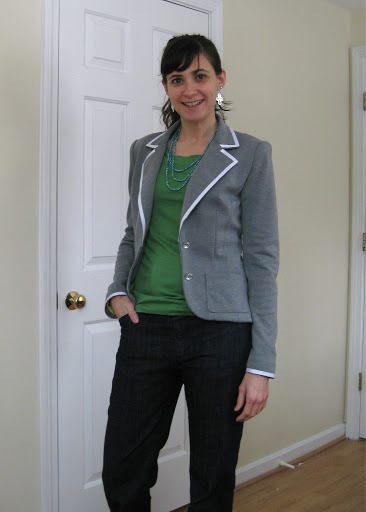 way back when colette patterns released the laurel, my thought was eh… great for a toothpick, not so much for my pear shape. however, this fabric spoke to me and suddenly i thought i’d try this shift business out. lo and behold, i’m really loving it! i’m as self-conscious as the next gal about those mushy tummy bits, and this completely avoids cling in that area. it’s cute for christmas mass, yet cozy enough to spend the whole day in. and EAT in. hello christmas cookies, caramels, and fudge! 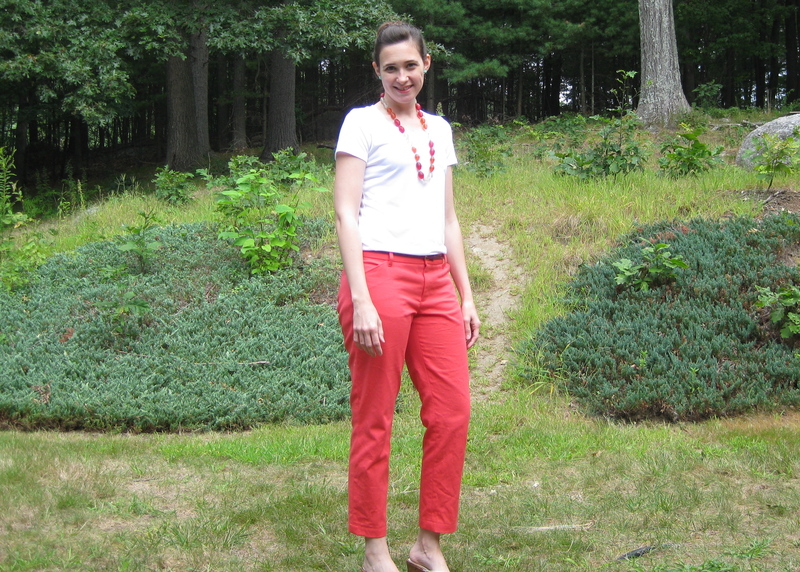 i love all the bright colored pants i’ve been seeing, and i finally got around to making a pair. 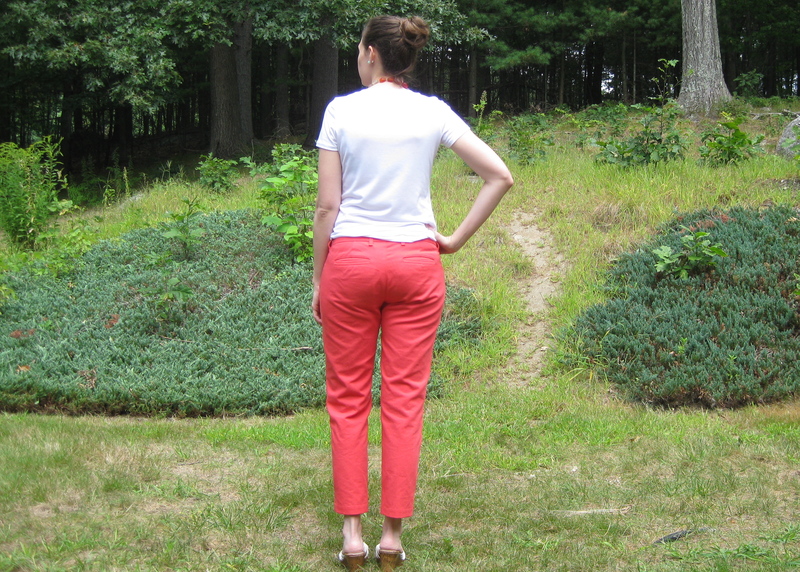 i ordered this coral twill a while back under the want of pink twill. pink… coral… same diff? eh. it’s just another fashionfabricsclub.com not-exactly-what-i-thought-i-was-getting acquisition. i really waffled on whether or not to make these pants because of the color not being what i had in mind, but decided to go for it if for no other reason than to experiment with making a skinny cropped thurlow. then, if they didn’t turn out, i wouldn’t be too bothered. and whaddayaknow, i think they came out pretty okay! i decided to give these a dressier edge and scale back on all the topstitching i usually do. also, since i knew i would be stitching and unpicking to get the leg shape right, leaving the topstitching out definitely kept the frustration at bay. i did topstitch the whole crotch seam because, let’s face it, my backside needs all the reinforcement it can get. i used a hook and eye closure, the waistband is stitched in the ditch to catch the facing, and i even sewed up a tube to make the belt loops instead of just topstitching the folds. i have to admit—getting the leg shape right was a lot more challenging than i had anticipated. i started out with a straight cut from about the knee down so i could easily taper in as i worked it all out. i’m not totally satisfied with the leg, but i have a much better idea of how to go about it for the future. after rounds of basting, taking in, letting out, taking back in… i finally just had to stop futzing and go with it. since this fabric is a non-stretch, it’s a delicate balance to achieve both wearability and good fit. i’ll certainly wear these pants, especially as the weather cools but before the chill really sets in; they’ll look great with my knit blazer, a denim jacket, my chambray archer, an in-the-works archer, and a few other tops in my wardrobe. they’re definitely a win, and definitely a learning experience! EDIT: in case anyone is interested, i wanted to add that i began tapering the outer seam about mid-thigh, then both inner and outer seam symmetrically from the knee down. 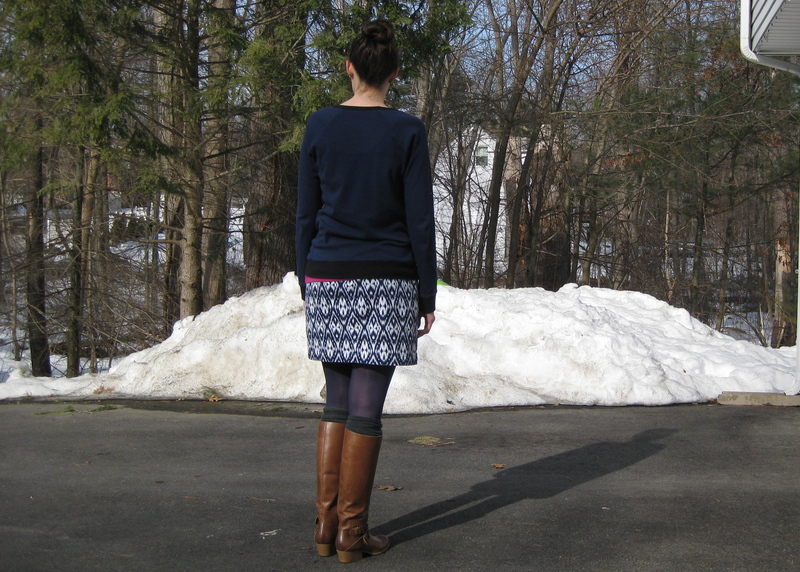 i left about 1 1/2″ ease at mid-thigh, 3″ ease at the knee, and the hem circumference is 13″ or 14″. the astute among you will notice my title says some basics; in other words, i also made the white tee i’m wearing. my last RTW white tees are pretty much only worn to bed, or relegated to what i wear for a heavy duty house cleaning, so it was time. a good white tee is the LBD of casual wear, and finding an appropriate white knit can feel a little like tilting at windmills. i got my fabric from girlcharlee.com (HERE) and it comes pretty close to ideal. 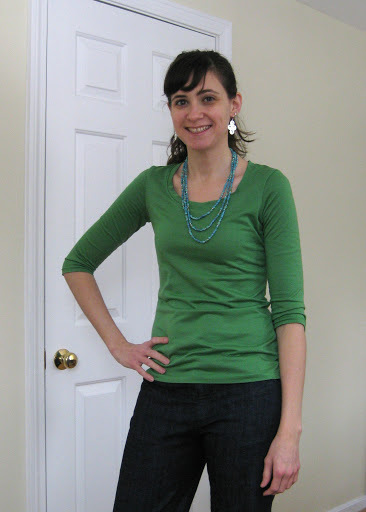 it’s a cotton/rayon jersey, it’s super soft without being too challenging to work with, and, while far from opaque, is good enough to not require a cami. 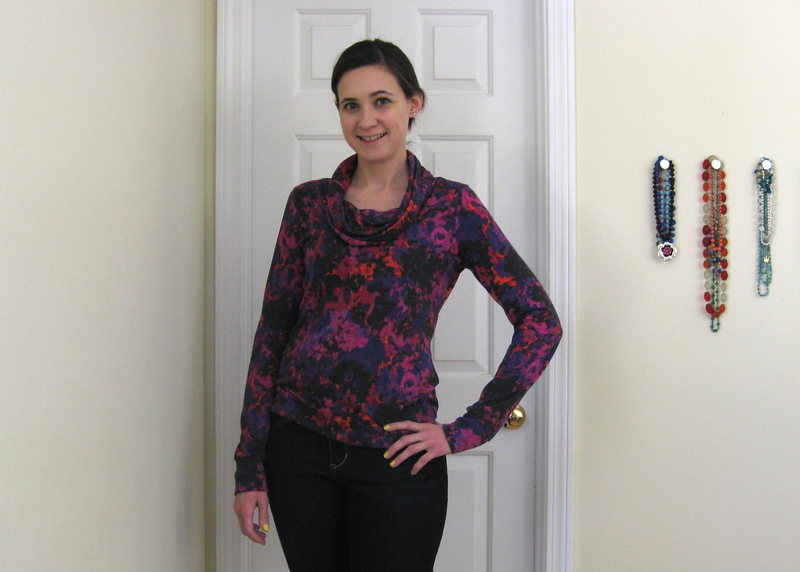 i used the renfrew pattern with hem and sleeve bands omitted. i cut the shirt 2″ longer to account for the lost length, and the sleeves… i can’t remember if i made any changes to the pattern piece, i traced that off a long time ago. 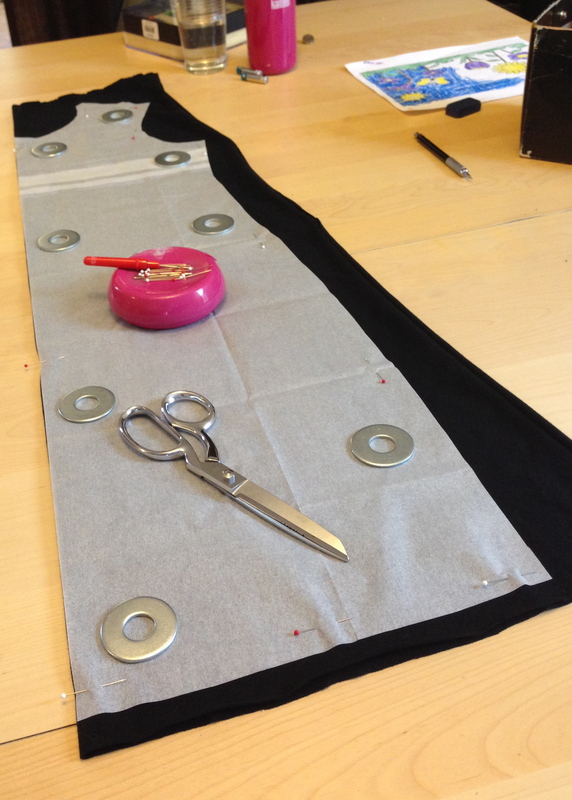 for reference, they are about 1 1/2″ long under the arm (after taking a 1/2″ hem) and cut straight across. the size 6 gives me a nice fitted tee, but i went with a size 8 since this fabric is thin. i find that thinner fabrics require more ease than thicker fabrics (knit or woven) and i really just wanted a nice comfy tee. mission accomplished! can’t really see the details on my shirt, you’ll just have to take my word for it that it turned out really nice! i thought i’d mention that the renfrew neck band has been the bane of existence for many people, and truthfully, i don’t even bother with that pattern piece. 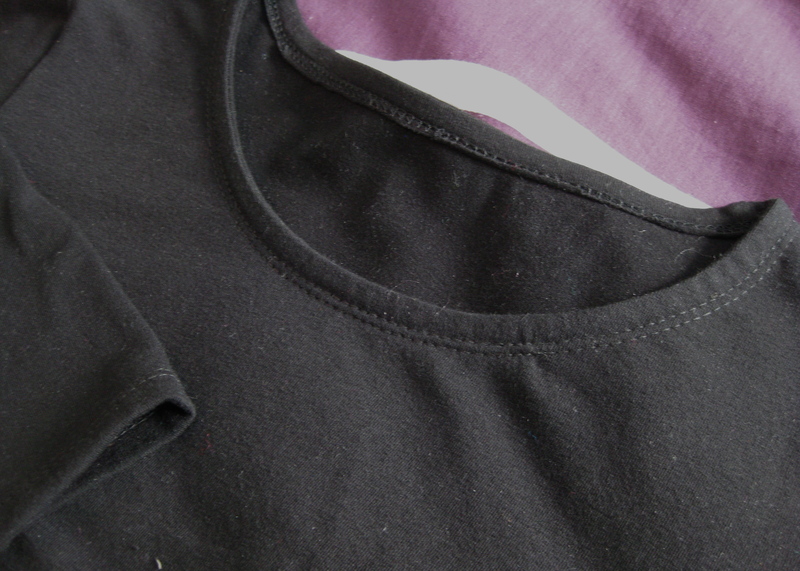 i sew up the right shoulder, attach the neckband, stretching as i feel necessary, then sew up the left shoulder. this is basically a fool-proof method if you ever have difficulty with knit neck bindings. yes, it means the one shoulder seam isn’t completely flawless, but it means that there is no guessing about neckband length and, most importantly, no unpicking and re-doing. if you’re serging, it’s easiest to leave only a 1/4″ SA for the neckline and band so you don’t have to worry about slicing off just the right amount evenly. 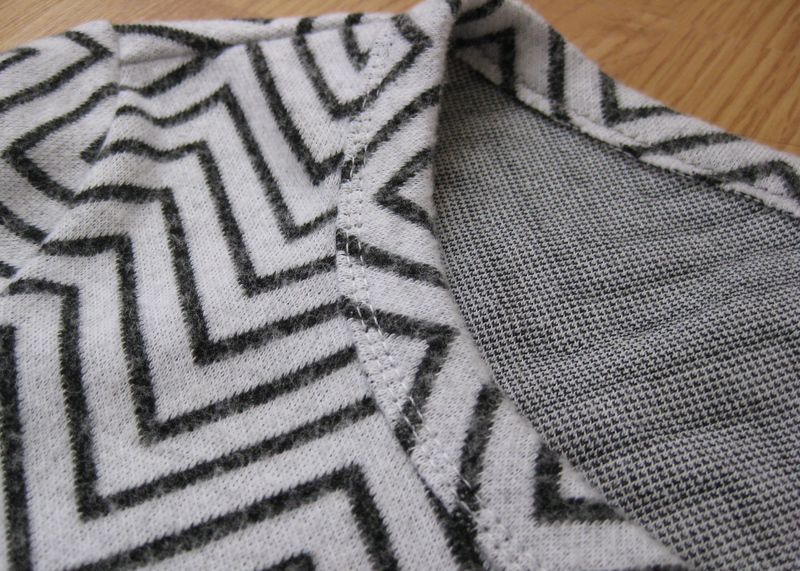 then i zig zag over the neckband join to keep it in place and call it a day. easy peasy! summer (in the school sense) is coming to an end this week. the three oldest will all be at school full time, which leaves just me and my 4-yr oliver at home (aside from a few hrs of preschool 3 days a week). oliver and izzie are so close and spend all day playing together without much attention from me, so having only oliver at home will eat into my daytime sewing for sure! i’ll have to go back to sewing at night most of the time, but it does give me the opportunity to do some activities with only him (izzie hates going out and when she’s bored or uncomfortable EVERYONE gets to hear about it). it will be a bit of an adjustment around here, but fortunately i have a small backlog of projects i need to get to posting about. happy first days of school everyone! there’s been loads of discussion around the blogs about how much the blogger platform stinks. i feel as though i’ve been fighting with blogger since day one, whether it’s about getting my posts formatted correctly, uploading pics, commenting (darn you captcha! ), and just generally not working when i need it to. when i started this blog i wavered between blogger and word press and claimed my blog name at both spots. blogger won out because it seemed less confusing to set up and more customizable. basically i’ve regretted it ever since. of this pattern by now. so i’ve decided to switch over to word press at some point when i have time to deal with that and hopefully it won’t be too traumatic. i am concerned that, because this is a picture heavy blog, that those might get lost. and that would be soul crushing. this is a nice drape-y rayon with a subtle sheen. it’s super soft, so i’ll deal. regardless, i will switch and the switch will probably happen on a whim late some night after one too many glasses of wine… so if you wake up to some weird feed of mine in your reader, i’m apologizing now! paired with my thurlows… it was only right. where i wanted them and twin needled the hems. also, i’m just wondering what ya’ll do with your pictures in general. i take what seems like a bazillion pics just to get one or two where i don’t look like a complete doofus. i try to make sure and delete the pics off my computer that i will definitely never use, but sometimes i’m in a hurry and think i’ll come back to it later. guess what. i never do. but now it’s nice and profesh looking. so now i have thousands of pictures of myself in iphoto, which makes me cringe every time i open the program because i HATE having my picture taken. i’m awkward, i don’t photograph well, i’m super self-conscious, i don’t know where to put my hands, ahhh!!!! right now i have to upload them to picasa first in order to put them on the blog. but it… takes… forever… and they’re really hard to organize. i use flicker occasionally but only have a few pics there. i haven’t come up with a good way of storing my pics, but i really have no need to keep them for the long-term if they’re on the blog, right? i just don’t know! what do you guys do??? ?